Have a look at this buggy wreck photo…can you believe the driver escaped “shaken, but not injured”? A horse-drawn buggy was destroyed Wednesday morning after colliding with a truck on a rural road in the New Perth area, near where many Amish families have bought farms in the last three years. Honkoop said the 17-year-old male driving the truck had failed to properly clear the windshield of frost outside and steam inside, and rear-ended the carriage on Route 22. Both male drivers were shaken, but not injured, he said. The horse was treated at the scene by a local veterinarian. It seems the main reason the buggy driver dodged death or major injury is because he was ejected. This is why seat belts in buggies makes little to no sense. Getting tossed clear of the wreckage may be exactly what you want to have happen. I shudder to think of the outcome if he were strapped into that wreckage. “It did have some light-to-moderate damage — flesh wounds, if you will. But it didn’t happen to be anything bone-related,” Honkoop said, noting that the horse fell not to its knees but to its chest, limiting damage. Buggy accidents happen sadly too often. If I shared every one, we’d have twice the number of posts here. I wrote about this one because looking at that photo I still can’t believe the person inside made it through okay. The photo also brings home what the force generated by a motor vehicle weighing tons can inflict upon a relatively flimsy carriage. It’s really no contest. There have been two or three accidents involving Amish since their arrival in Prince Edward Island, according to Constable Honkoop in the article. For the most part I think the Amish have been welcomed here, with buggy warning signs and hitching posts put up in the area. 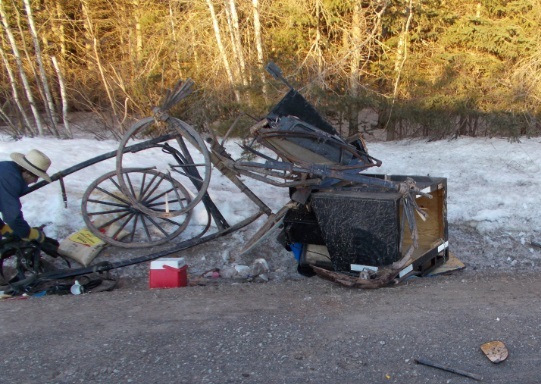 Seat belt would of killed the carriage driver as well as its passengers. Just like my son who was in a snowmobile accident 2 weeks ago. He was on a marked trail, his sled ran onto a stump on the trail was thrown 70 feet. Yes, he was at a racing event. He suffered a torn ACL and MCL. He is alive. No seatbelts. Had a belt been used he would be dead. Now school buses should be mandated. Glad to hear your son is okay albeit injured. I think generally if the vehicle is large enough and built to offer some sort of protection from impact then seat belts would make sense, and not really for smaller or less sturdy vehicles where being attached to them could create risk of being crushed. I live in the area where the people who have moved to P.E.I came from l.
I am very good friends with the people are where I live and I spend most of my time driving them to various appointments and for shopping. I know the family involved in this accident and am very concerned about the people and also their neighbors who need to be more aware of the buggies on the roads. I could go on but I think that I’ve given what believe to be of help to all involved the users of public roads . Thanks Peter, I think what you say is sensible. I think that impatient drivers are a reality everywhere. Hopefully when people see visual evidence of how terribly these buggies can be destroyed, that it inspires them to use more caution. I appreciate you sharing the local perspective and all best to the family involved and the community. At the risk of soundling like a borken record, the buggy accidents will get worse as Amish population increases. We need to either design roads to accommodate horse and buggies where population of Amish is great, or ban horse and buggy transportation altogether. It’s just not safe. The buggy is not a safe vehicle, the horse is put in an unsafe environment and is being forced to perform in an all too stressful arena, and motorists are also put in a compromising situation, even if going the speed limit. Most roads traveled by Amish are not back country roads anymore. Where is Ralph Nader when we need him? Some of us here pray for an answer that addresses this problem, where all in the end are safe and happy. Buggies are not a problem on the road. I meet and pass them every day in Dundas and Summerville area. Buggie/car accidents are nothing compared to car/car. Should we take all slow moving (farm equipment, mothers with strollers, joggers, bikes,etc off roads. I do not own the road and must share it. Kevin, I get what you’re saying, and ideally roads should be shared. However, a horse and buggy in this case is equal to a car in that they are transporting and following road signs and going with traffic flow. A horse is pulling the buggy though. I have witnessed first hand car occupants deliberately taunting the Amish driving the buggies, honking horns chastising them for going to slow – shouting move over – passing the buggy too close! This alone could send a horse out of control. Equally, there are Amish that refuse to use the triangle reflectors, “some” buggies have no lights, and are largely black in color; drivers can’t see them as they go screaming by at night. Buggies are not made like a car; they’re vulnerable and have no safety legislation guidlines. Trips to Walmart, Amish familes take their life in their hands, as tractor trailors, groups of motorcycles, campers, buses, etc. do the speed limit of 45mph to 55mph, passing the vulneralbe horse and buggy going 10-15 mph. A buggy wheel hits a pot hole, wheel spirals off, and there’s a mix for a big time accident. Share the roads? No one shares a road with that differentiantion in speed. So until roads are fixed to accomodate buggies on busy road ways,[not to be confused with countryor back roads], in my opinion they should be banned to protect all commuters. Banning all cars seems like a drastic measure, but if it’s necessary to protect human life and guarantee public safety, I suppose I am in favor. Roger, I’m not saying ban cars, I’m saying ban horse and buggy on well traveled roads where speed limits are over 30mph. In widely populated Amish areas, there shoud be a road remedy [See Gary’s post], but until then – the horse and buggy should be ban on major roads. It’s good to hear from Peter, as he lives with and serves the Amish by driving them as needed, and has intimate knowledge of being on the road with horse-drawn buggies. I agree that the locals (government, residents) need to learn how to “share the road” with slower-moving vehicles, especially horse-drawn buggies. It just makes sense, and since the Amish WANT to live there, have purchased land there, it’s fair to assume they’re staying put. People, in general, are in such a hurry these days, that they disrespect the lives of their own passengers as well as others on the road when they refuse to SLOW DOWN FOR SAFETY! Even where I live, where there are still a few farms and many acres of farmland, I see people trying to “get around” slow moving farm vehicles as they move down the road (fields will soon be plowed and planted, so I always anticipate some slow-moving vehicles being on the road this time of year). How miraculous that both drivers survived! Good point Alice Mary, we are thinking similarly. Hopefully these images were put to good use and shown on local news, etc. Since it’s a new area people might simply not get the dynamics of driving around buggies and the potential bad outcomes when driving carelessly. Why is such a young (boy) allowed to drive such a big truck? Shame on the one’s who let him. You would think maybe lights on the buggies would help, a little, maybe?? I would call it common sense but no onewill push it until sombody gets killed. Not sure if these Amish use lights on their buggies but the majority of Amish do. Looks like this was a daytime accident but may have been a time to have lights on if it was very early morning. accidents. Lets not always blame the Amish. Maybe that is partially what is needed…TWICE the posts….and possibly that might help, make a difference with auto drivers, to realize that it is a major problem! Also, I wonder what laws have/have not been put in place, such as fines when drivers follow buggies too closely, pass too fast, and/or honking, yelling, or throwing objects? Thanks CJ, here is a listing of buggy accidents by year going back to 2010, with dozens happening each year. I’m not sure if it’s really an awareness question as in a lot of cases the drivers are locals who live in the area, are used to being around the Amish and you’d assume understand what speeds they drive at, know of risks like passing on curves, etc. It seems these often involve careless driving or an environmental factor like the glare of the sun or precipitation or frost obscuring the view as in this case. Either way I will continue to post about buggy accidents. Interesting from the legal perspective, I hadn’t thought about additional laws in the context of what might actually be effective and enforceable. But maybe there is something that could be done in that area. Gary, you’re “outa the box” post is genius logic to me.